An electric shaver not only removes facial hair, but accumulates debris: Stubble, dead skin cells, skin oils, dust and other airborne particles, and microbes (which feast on the aforementioned detritus). Cleaning and sterilizing your electric shaver should be an important part of your maintenance routine. 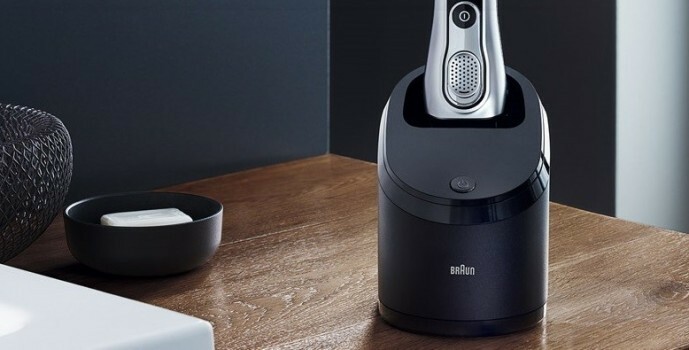 A shaver can be cleaned manually, but the best way by far is to use an automatic cleaning system – and none are better than Braun’s Clean & Charge Station. Foremost, the Clean&Charge station is a convenient timesaver. 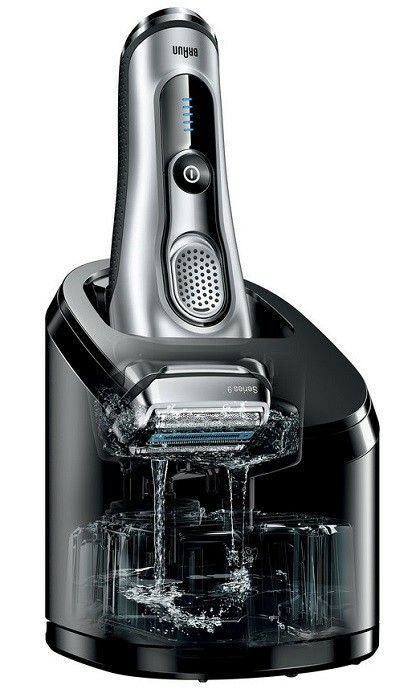 Instead of upending your electric shaver, tapping out debris and rinsing it down the drain, or removing and disassembling the shaver head, swabbing it out, and soaking the components to disinfect them, all that’s necessary to use a Clean & Charge station is to insert a shaver, head down, into the station, and press a single button. Braun’s highly refined system does the rest. Maximizes performance and comfort. 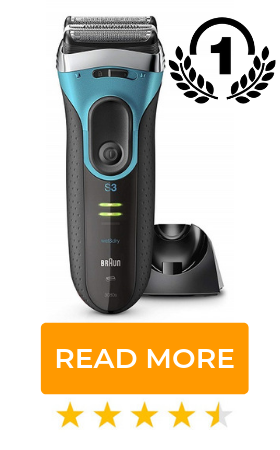 An extensive study, undertaken by Braun, noted consistently improved shaving closeness and greater skin comfort with regular use of the Clean&Charge Station—findings consistent with Braun’s assertion that the Station keeps shaver blades in top condition. Optimizes hygiene. Shaving – even with a high-end electric shaver – strips your skin of its protective outer layer and natural lubrication, increasing susceptibility to irritation and infection. A poorly-maintained, unclean shaver harbors microbes which, left unchecked, can wreak havoc with your skin. Using the Clean and Charge station as directed ensures that your shaving head is not just visibly clean, but hygienic, for a fresher, more comfortable shave. Cleanliness and sterility are achieved through the use of a proven, alcohol-based cleaning solution. Alcohol acts both as a solvent, dissolving facial oils and debris, and as a disinfectant – demonstrated to be ten times more effective that rinsing a shaver head under running water – killing 99.9% of all germs and bacteria. Your shaver is charged automatically every time it’s placed in the Clean&Charge Station – far and away the simplest charging method, surpassing in convenience both power cables and single-function charging stands. Shaver blades are automatically lubricated with a refreshing, lemon-scented lubricant. Regular blade lubrication reduces friction, improving cutting ability, and prolonging the life of your shaver’s blades. Following the cleaning and lubrication cycle, the Clean&Charge Station thoroughly dries your shaver, driving out any performance-inhibiting moisture. Braun’s Clean&Charge Station features multiple cleaning modes. However, instead of you having to determine which mode is most appropriate for your shaver, the Station performs an automatic assessment, selecting the optimal level of cleaning intensity. Automatic mode selection doesn’t just save you time – it conserves cleaning fluid and prolongs the life of the Clean&Charge Station. However, you may always override the Station’s inbuilt mode selection in favour of the Fast Clean mode, which, while not as thorough as the most intensive regular mode, requires only twenty five seconds to clean your shaver. Which Braun Shavers Include a Clean & Charge Station? The Clean&Charge Station is as easy to maintain as it is to use. No messy bottles of fluid, no manual refilling – just a simple, quickly replaced cartridge that contains Braun’s patented, alcohol-based, lemon-scented 2-in-1 cleaning and lubricating solution. To replace a Clean & Renew cartridge, unplug the Clean&Charge Station; remove the used cartridge from the base of the Station; pop the seal off of the new cartridge and place it on the old one (for mess-free disposal); insert the new cartridge in the base of the Station, and close it. To be certain you’ve correctly replaced the cartridge, plug the Clean&Charge Station back in; check the indicator light; insert the shaver; and power on the Station. (Note: Instructions may vary, depending on the particular model of your shaver and Clean&Charge Station. Always follow the provided instructions.) 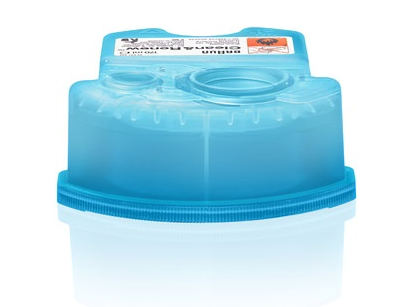 Clean & Renew Replacement Cartridges are cost-effective, requiring replacement only every thirty cleaning cycles. 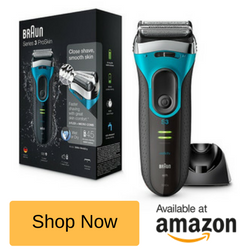 Cartridges are available from big retailers such as Amazon, Argos, Boots, and Braun – we currently rate Amazon as the best place to buy, and typically offering the best deals.